you are looking for the best hand held shower combo then you can check out HotelSpa Designer Collection Ultra-Luxury shower combo. 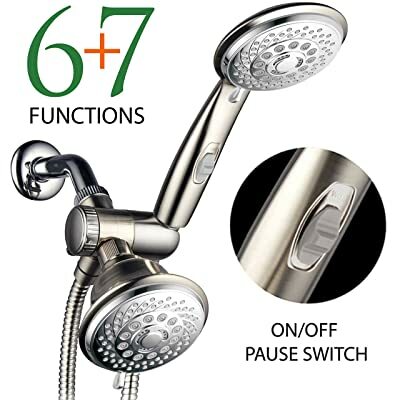 It is equipped with some of the best features and specifications you can expect to find in a top quality showerhead. In this review, we are going to look at the top features and specifications that define the quality of this showerhead combo. This showerhead combo allows you to choose from 30 full and combined water flow patterns. This means you can appreciate a great deal of showering experiences. It also features a number of settings including pulsating massage, power rain, rain/mist, rain/massage, hydrating mist, and water-saving economy rain. One thing you will love about high quality handheld combo showerheads is the flexibility it offers you especially when it comes to installation. It is compatible with standard shower head arms currently installed in most bathrooms. Installation is quick, easy and does not require any special tools. Each package comes with start to finish instructions on installation. The tools you need may include Teflon tape, adjustable wrench or pliers, rubber sealing washer, terry cloth, safety goggles and possibly a ladder and the new showerhead combo tip. This product features stunningly beautiful and exclusive 2-tone design enabling it to match both nickel and chrome bathroom finisher or décor. The combo design allows you to use the shower together or each shower differently. It comes with 5-inch super flexible stainless steel hose with conical brass hose nuts that are easy to adjust and tighten. The stunning two tone design makes it look exclusive and luxurious. Delivers great performance with up to 30 different flow patterns. Its highly versatile with six different settings allowing you experience the best showering options. The showerhead is very easy to install; requiring no specialized tools. The dual-tone finish makes it compatible with both nickel and chrome bath fixture décors. Leaking seems to be the commonest problem with this HotelSpa showerhead combo. The handheld portion seems not to fit snugly in the holder when held up although it is not too lose to fall out either. HotelSpa Designer Collection Ultra-Luxury 2-tone Chrome/Brushed Nickel 30–setting Combo offers you a great deal when it comes to the choice of the best Showerhead combo to install in your bathroom. It is flexible, versatile and elegant. Choose to install it and you will not regret the decision.